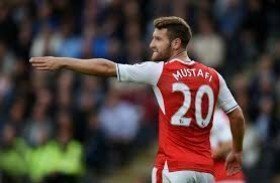 Arsenal set to permit Shkodran Mustafi exit? Mustafi on the move this summer? Arsenal are reportedly prepared to sanction the sale of Shkodran Mustafi during the summer transfer window in order to recoup funds for other purchases. The Germany international has been with the Gunners for the past two-and-a-half seasons but his performances have been scratchy with mistakes every now and then. According to The Telegraph, the north London side have identified Mustafi as one of the weaklinks in the squad and they are prepared to sell him to boost their summer transfer kitty. Gunner boss Unai Emery has been allocated with just a £40m budget for the summer but he has the opportunity to offload some of the first-team players to enhance his finances. Aside from Mustafi, Mesut Ozil is another who has been tipped to make way from the club after struggling to secure regular gametime during the course of the ongoing campaign. Arsenal are currently three points behind Chelsea in the race for the fourth position in the standings. They recently suffered a 3-1 defeat at the hands of Manchester City.